HDR2 Handheld Digital Recorder. 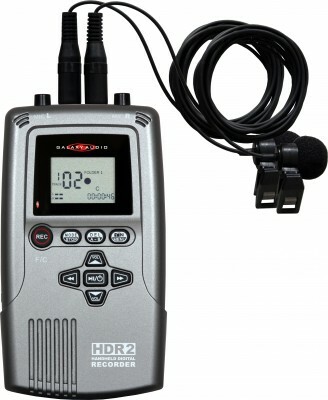 This unit has the features to perform in a wide variety of recording situations. The HDR2 is small enough to fit in a pocket, briefcase, gig bag, backpack, or to just carry around in your hand. The HDR2 features both a built in 128MB flash memory and an SD card port (supports up to 4GB SDHC cards.) The HDR2 will record in either WAV or MP3 formats. The WAV format offers your choice of six different sample rates. The mini USB 2.0 jack makes transferring data to or from a computer (either flash memory or SD) as simple as drag and drop. There are two internal microphones which may be used alone or in conjunction with the two ¼” inputs. These inputs include a switch to choose MIC, GUITAR, or LINE levels as well as rotary level knobs for fine-tuning. A three position switch (HIGH, LOW, or OFF) sets the internal mic level and allows a recording mix to be created between them and the ¼” inputs. The HDR2 features a stereo line output, stereo headphone output, and an internal speaker for playback. The HDR2 is simple to use. Simply turn the unit on, select flash memory or SD card to record to, push record, and you're recording. The HDR2 will not allow a previously recorded track to be recorded over. Instead, it will automatically select the next available track. However, any track may be easily deleted and used again. Multiple file folders are available for storing different projects. The HDR2 runs off of 2AA batteries (alkaline or rechargeable), or from the supplied USB transfer cable. Accessories include two condenser microphones, 2 AA batteries, ear buds, and the USB transfer cable. Optional accessories consist of a USB power cable (to power the unit from an AC wall outlet) and a leather case with easy access controlling and a tripod mount. 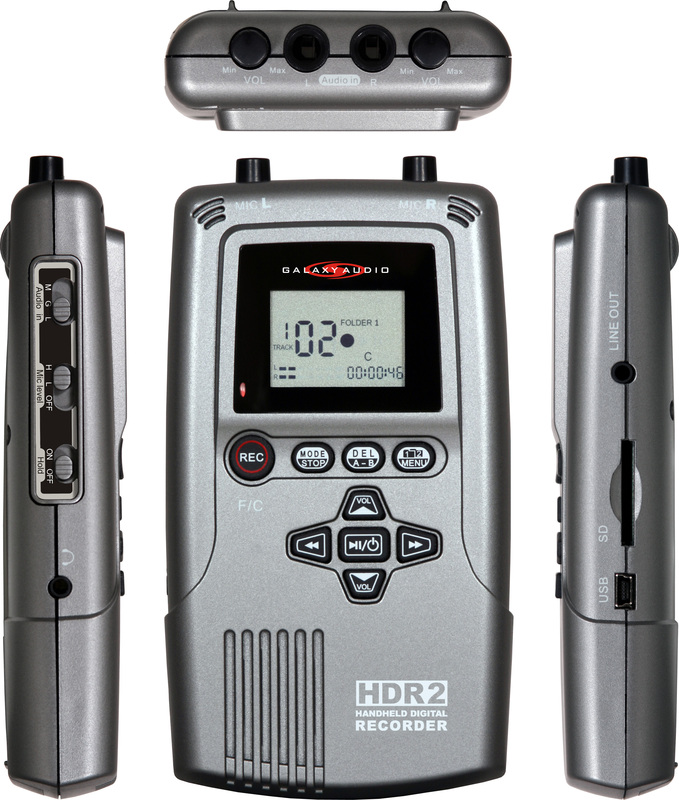 The HDR2 is great for recording band rehearsals/gigs, boardroom meetings, college professors, and it's an indispensable tool for singer/songwriters. Two 1/4” TS jacks with 4.5Vdc supply for external mics. Switchable to Line, and Guitar levels. AA battery x 2, USB transfer cable, or USB AC adaptor 5V (not included). Two lapel microphones, USB cable, two AA batteries, and ear buds.